Yesterday I worked in Liechtenstein National Museum. As I do that partially since 2003. In one moment I got a phone call. I looked the number and believed, it's from a very good friend of mine I met for the first time in Sofia 2003. 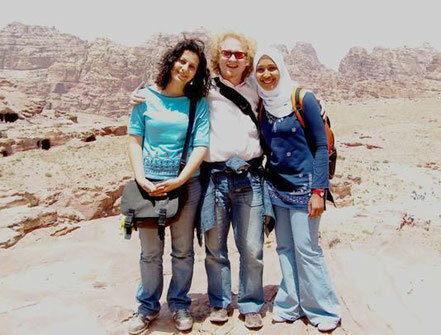 He is now director at the College for art and design at American University in Dubai. At the moment, one of speakers in World Art Dubai 18-21. April 2018. PhD, Arafat Al-Naim and me, met again in 2006 in the frame of 1st Symposio design where I was invited to participate. Last time we met live in 2016 in the College in Dubai where his is dean... and before that, also in Cyprus 2011. He surprise me in the most positive way "all my life long". In Dubai, I was invited to hold a short speach in front of his students and colleagues when I was on my return to home from Al-Ain where I participated in a great international Art Symposium. "Here I have somebody who wants to say hello to you." Maybe just one month ago, Arafat made a phone call and on a similar way impressed me with the news, someone in his near, would love to say hello to me. Our common Indian friend, a very famous graphic designer Sudhir Sharma, from Pune. This is a little bit funny because maybe one week or ten days before Arafat and Sudhir called me, Sudhir was with his wife Marianna our guests in Liechtenstein and Switzerland! 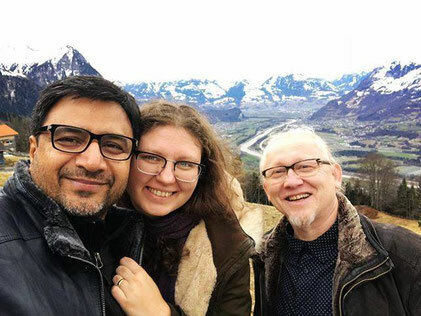 Sudhir Sharma, Marianna Sharma, Vlado Franjević in Liechtenstein, 2018. HOPE AFTER YOUR READING THIS BLOG, YOU'RE SO NICE GIVE A LITTLE, LITTLE SIGN ABOUT... HERE BELLOW, AS A COMMENT! THANKS SO MUCH IN ADVANCE!